Although you might have experienced much success in your career, have you ever had that nagging feeling that you can do better? You might want to take your business performance to a higher level, but you aren’t quite sure how to do it. As a CEO, you can’t confide in just anyone about your concerns, especially others within your organization. A CEO coach can be your sounding board, by listening to your concerns, ideas and the various situations that always need your attention. You benefit from the years of incredibly valuable business experience and knowledge your CEO coach brings to you. Business coaching is a recent development. Businesses and executives have been managing without them for years, so why start getting coaching now? Unfortunately, a lot of people think that you don’t need coaching unless you’re failing—there’s a mentality of “if it ain’t broke, don’t fix it,” and that getting coaching is a sign of weakness. The reality is that having somebody with the experience and wisdom that Mark has to help you make the best possible decisions is your greatest strength. Join Mark for a workshop and choose from either the Vistage Version or Advantage Version. Both will let your business harness and direct positive sales energy to grow your customer base like you haven’t done before. The right coach can help you grow as a business leader and help you ward off problems before they ever have a chance to come up. Professional athletes use coaches to get and stay at the top of their game—why shouldn’t successful business owners? Like athletes, if you’re not actively improving, you’re probably stagnating, which neither you or your business can afford to let happen. Markets, technologies, and workforces are all shifting in ways that can be hard to keep track of. There’s a lot of legal and financial scrutiny and pressure on businesses. Board members can be focused more on concrete financial results rather than improving a CEO’s performance. You employees are naturally hesitant to criticize you and you can’t really talk about problems with staff members with other staff members. Trying to handle all of this on your own is a perfect way to burn out and lose a lot of opportunities. A CEO coach, like Mark T. Moore, can help. 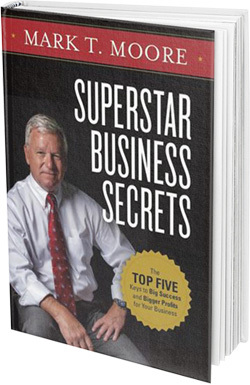 Mark is the founder of Sales KnowHow and author of Superstar Business Secrets: The Top Five Keys to Big Success and Bigger Profits for Your Business. He has over 30 years of international business experience that he’s invested not only on building his own companies, but also speaking, presenting workshops, consulting, and writing. Now, he can give you the personal CEO coaching you need to grow as a business leader to dramatically improve your performance. You win by having a trusted confidante and a neutral party. Mark has the experience to know where to look and how to fix your blind spots in a safe, focused, one-on-one environment. He is passionate about helping people just like you reach your highest potential and is only concerned with your success as a leader. He looks at your needs and then helps improve your talents so you can develop solutions to whatever comes your way. What’s more is that he’s a truly engaging leader who can help you with those “soft skills”—the ones that are more important to running a business than people think. As a leader you don’t just tell people what to do—you need to inspire the people around you to be successful, which you do by modeling the very qualities that attract success. Things like motivation, compassion, commitment, authenticity, and reliability. You may be the leader, but you’re also part of the team, and those skills can help your team work together effectively, leading to far more success for everyone. A good leader knows what works. A great leader does everything in their power to do better. A Superstar Business leader contacts Mark Moore for business coaching. Fill out our online contact form for more information. You are going to have so much fun with Mark as your trusted advisor!